GS-750™ / 60 tabs - Nature's Way®. Take 2 tablets daily. If pregnant, nursing, or taking any medications, consult a healthcare professional before use. ‡As compared to GS-500™ with 500 mg per tablet. What is the source of the glucosamine in GS-750? The glucosamine sulfate in GS-750 is extracted from chitin, a hard, cellulose-like compound that is the main component in external shells of crustaceans such as shrimp. Is the glucosamine sulfate in GS-750 stabilized? Yes. 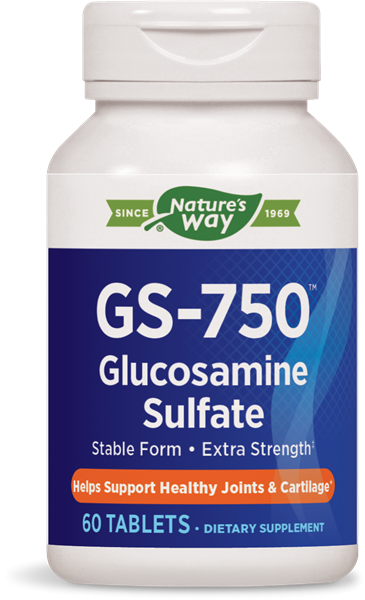 The glucosamine sulfate in GS-750 is stabilized with sodium chloride. Glucosamine must be stabilized and absorbable to see results. Unstable forms of glucosamine can have less than a 90-day shelf life.